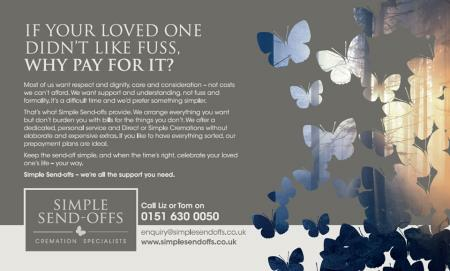 Simple Send-offs are a low-cost cremation provider based on the Wirral and covering the North West. We provide a first class, caring and professional service that is generally more than £2,000 cheaper than a High Street funeral director. We provide all the services one would expect from a traditional funeral director whilst using our years of experience in the industry to trim away any unnecessary and excessive costs of a cremation. Please visit our website www.simplesendoffs.co.uk for a fuller explanation of the services we offer, or alternatively call us for free on 0800 246 5292.